Ballet Ariel opens its 20th anniversary season of performances with Tale of Molly Brown. This original ballet, by master storyteller and Artistic Director, Ilena Norton, was developed in collaboration with the Molly Brown House Museum, depicting the epic life of local legend, Molly Brown. This three-act ballet follows Molly from her modest life as a young woman in Leadville, through her rise in Denver society to her involvement in the suffrage movement, and later, survival on the Titanic. Narration provided by a costumed Molly, festooned in feathers and velvet, brings the audience deeper into the story. Norton beautifully incorporates her trademark elegant choreography with pioneer-inspired dances. The ballet’s score features traditional songs from the era including “Yankee Doodle” and “To a Wild Rose”. Gossamer Winds Quintet will provide live accompaniment for all performances. Ballet Ariel will also be performing La Vivandiere, a one-act ballet choreographed by the great dance duo Arthur Saint-Léon and Fanny Cerrito with music by prolific Italian composer, Cesare Pugni. 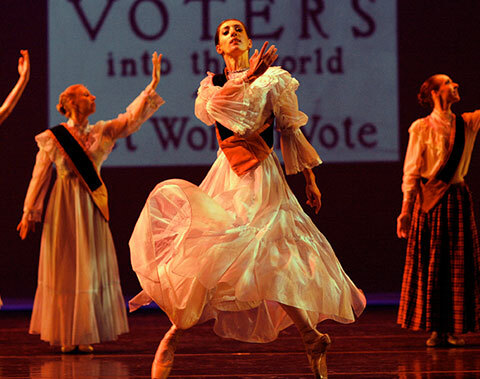 La Vivandiere, an enchanting ballet, debuted in London in 1844. Now, Denver audiences will have the opportunity to experience this perfectly preserved ballet, staged by Patricia Renzetti and Oleg Dedogryuk. 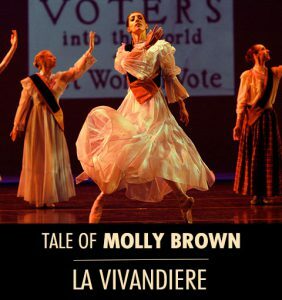 Tale of Molly Brown and La Vivandiere will be performed at Cleo Parker Robinson Theater, 119 Park Ave West, Denver, CO 80205, on October 6, 2018 at 7:30 p.m. and October 7, 2018 at 3:00 p.m. Tickets are $25 for adults, $20 for students and seniors, and $15 for children. Tickets can be purchased by visiting www.balletariel.org or calling 303-945-4388. Both ballets will also be performed at The Schoolhouse Theatre, 19650 E Mainstreet, Parker, CO 80138, on October 11, 2018 at 7:00 p.m.